Inshore water temperatures have risen to the low-60s in the Little River area, while the water generally remains gin clear. 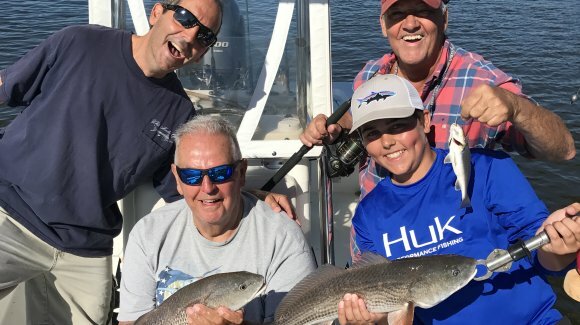 While conditions have been pretty windy in the Little River area, Captain Patrick “Smiley” Kelly (843-361-7445) reports that inshore fishing is off to a good start this spring. There have been some big trout caught out at the Little River jetties, while on the inside some smaller ones have been landed. There have also been some keeper-sized fish caught around the Sunset Beach Bridge and Dunn Sound. In the Inlet the falling tide has been most productive, with the incoming best in Dunn Sound and the outgoing best in the Calabash River. Vudu Shrimp and Mirrolures have been working well. 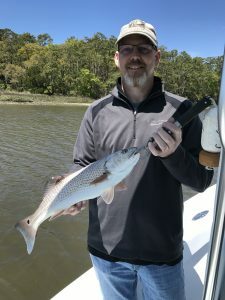 Some smaller redfish have been caught dock hopping in the IntraCoastal Waterway, and they will bite on Gulp! baits fished on a jighead. However, there are plenty of black drum around as well, and so the best bet is to fish fresh shrimp which both species will eat. The main bait stealers right now are some small Virginia perch, and so fishing with shrimp is not too bad. By the time you can throw a cast net for shrimp in the creeks the pinfish and other bait stealers will have arrived en masse – and fishing shrimp gets tougher. Small black drum and redfish can also be caught in the smaller creeks, particularly on the falling tide. However, boats can’t stay too long or else they will be stranded.